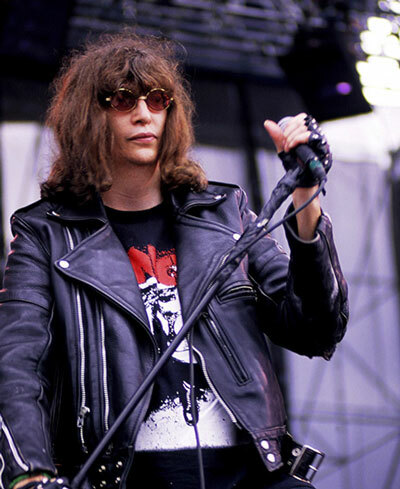 Jeffrey Ross Hyman (1951–2001) was the lead vocalist of the Ramones, and had his name changed to Joey Ramone. Later Johnny Ramone became involved with Linda Ramone, Joey’s girlfriend at the time. This incident sparked several of Joey’s songs, such as ‘The KKK Took My Baby Away’ and ‘She Belongs To Me’. Joey and Dee Dee wrote the song ‘Bonzo Goes to Bitburg’, in protest of Ronald Reagan’s visit to a German military cemetery where SS members were buried. See also Barbara Ramone, Johnny Ramone, Dee Dee Ramone, Tommy Ramone, Marky Ramone, Richie Ramone, Elvis Ramone, C. J. Ramone, Linda Ramone and Bonzo.